Each and every day, healthy adoptable pets are in jeopardy of losing their lives – simply because they are taking up too much space in shelters. As animal advocates we all know it takes a village to save a life. Rescues are an integral part of the village and today we start our series with an interview with Kelly Reeves, Co-Founder and President of Paw Prints in the Sand Animal Rescue (PPITS). PPITS has been running for 5 years now and we wanted to know find out the inspiration and what it takes to be successful. I have been a PR professional for over 20 years and have worked with everyone from celebrities to global tech and fashion brands. I am from GA and was always the kid who brought stray animals home, I have always been an animal lover, but I got more heavily involved in animal rescue about 8.5 years ago when I adopted Stella, my first dog as an adult. She was rescued from a kill shelter, which I didn’t think even existed any more! I connected with her foster on Facebook and began seeing all of her posts on dogs that were red listed and scheduled to be euthanized. I couldn’t turn a blind eye. I had to do something. I feel regardless of your faith or beliefs, when some higher power puts something on your heart, you can’t ignore it, and I know God definitely put this on my heart and made it my mission and purpose. How do you balance having your own PR company and animal rescue? It is a very difficult balance. There’s always something to be done either with my PR work or for the rescue. I try to think of the rescue as just another PR client, but it is so much more. I am the co-founder and responsible for running the organization and the lives of the animals we save. Plus, there is the emotional toll that comes with animal rescue. The PR side helps me balance that out and focus on something other than the daily tribulations that are a part of animal rescue. Social media is an obvious outlet to network the animals. How do you use social media and what channels do you find the most effective? What is PPITS mission statement? “Our mission is to save as many lives as possible and put an end to animal abuse, abandonment and neglect. We strive reduce shelter overpopulation, needless euthanasia, owner surrenders and the number of stray animals who roam our streets by promoting spaying and neutering, responsible pet ownership and pet retention.” However, as we continue to grow and add more programs like ’Shelter to Service’ and “Seniors for Seniors” our broader mission is to encompass both humans and animals and how we can enrich the lives of both. What is your biggest challenge as a rescue? We are a foster-based organization. We don’t have a facility, so the only way we can save a life is to have a dedicated foster in place. We have been blessed and are very grateful to have amazing fosters, but it’s always a challenge to recruit more. This is mainly for a few reasons: people rent and they can’t have a pet at all, or they can’t have a dog of a certain breed or over a certain weight. Many aren’t willing to take on the unknowns of fostering a rescue dog; and many simply don’t have the time. Another challenge is volunteer recruitment. We have some key positions that we have been trying to fill for some time including Fundraising Coordinator, Foster Coordinator, Adoption Coordinator, Accountant…. These do take time and people are busy. It’s a big ask when people have full time jobs, families, etc. to take on a big responsibility and commit the time without any monetary pay. I think our final challenge is fundraising. We take on a lot of high medical needs cases that cost us thousands of dollars. We always hate to say no to an animal in need because we simply cannot afford the care that they would require. Is there anything that you want people know about rescue? There is so much to say! Shelter reform is a big deal. Breed Specific Legislation in a big deal. Spaying and neutering is a big deal. There is so much that goes on “behind the scenes”- meaning that unless you are involved in animal rescue, there’s no way of knowing all of the issues, and there are many! When I tell people, they are often flabbergasted – as I was when I first became friends with Stella’s foster mom. It would be great if more people took time to understand the issues. Don’t turn a blind eye because it’s upsetting. Yea it’s upsetting! If it weren’t upsetting, there wouldn’t be a need. If it upsets you, you have the responsibility as a member of humanity to do something. And it doesn’t have to be any grandiose act! Donate $5 per month to a trusted rescue; share their social media posts; volunteer in any capacity, even if it’s just for an hour. It all matters and it all helps! I guess the most important thing for people to know is that rescue pets are awesome. 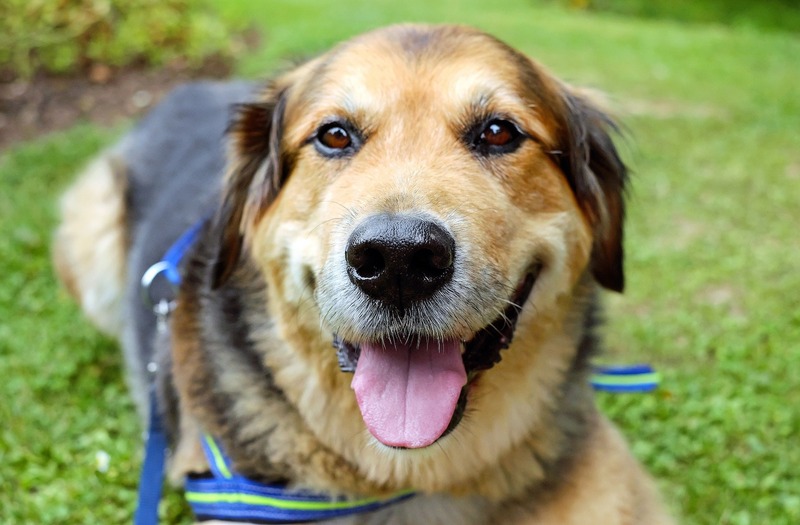 Senior pets are awesome and to please take a chance on them. That’s where true unconditional love is realized. You can get involved with us by checking out our volunteer page at www.pawprintsinthesand.org or our VolunteerMatch profile. You can also email us at info@pawprintsinthesand.org. Fosters are always needed. Donations are always needed. If you want to get involved with a rescue in your area, or maybe one that specializes in a particular breed or in a particular area of rescue, say equine rescue, then do a Google search, check out their social media pages, check their GuideStar ranking and make sure they’re legit. Be the ‘go-to’ App for animal lovers to network dogs and cats at high-kill shelters in the UK, US and Canada to ‘share to save a life’ from death row. Pet Pardon was formed to raise awareness of the number animals – many who are perfectly healthy, that are being euthanized every day at shelters in the US, Canada and the UK.